It seems that even in 1973 'Amon Düül II' still wanted to do double albums! But, instead of making 'Wolf City' into a double, somehow this side-line project came in to being. "Utopia" were basically fronted by three musicians who had earlier worked together in 'Passport' (on their debut LP) joined by the rest of the cast of 'Amon Düül II' and a few other jazz-fusion talents like guitar whiz's Joe Quick and Siegfried Schwab and a big cast of percussionists. 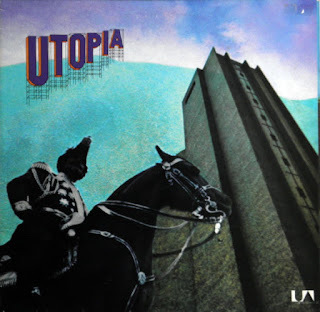 Although since reissued as an 'Amon Düül II' album, "Utopia" was in fact a different much jazzier and bluesier offering, focusing on Jimmy Jackson and Olaf Kübler's jazz origins, and more on Lothar Meid's songs. The results (featuring in common slightly different versions of "Deutsch Nepal") were that 'Wolf City' and "Utopia" became the "yin and yang" of each other, if you know what I mean!